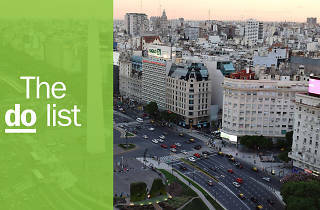 Argentina’s vast metropolis is a melting pot of cultures and colors, of food and football, history and, above all, tango. Pulsing with life as only the truly great cities can, it swings to its own beat 24 hours a day and never seems to sleep. 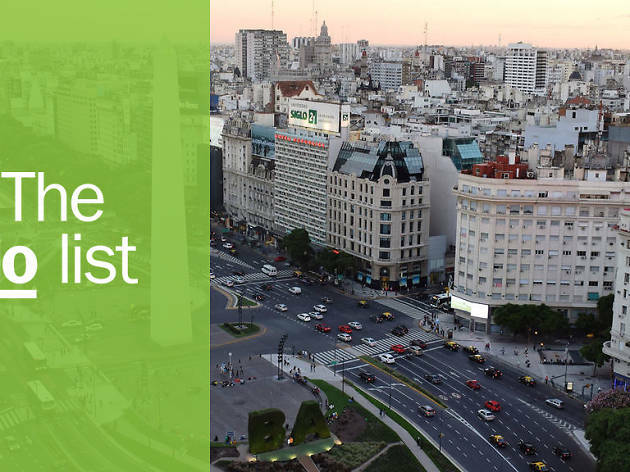 A city of neighborhoods – each with a distinct blend of local and national cultures, almost all worth visiting – it can be tricky to feel like you’ve really experienced Buenos Aires. Which is why we’ve danced on the streets, gorged on the meats at the city's best restaurants, and explored local markets, attractions, shops and hotels to uncover what really makes it magic. Don’t forget your dancing shoes. What is it? BA’s number one soccer team, once home to the legendary Diego Maradona, plays out of the talismanic Bombonera stadium in the La Boca neighborhood. Why go? Visiting BA without embracing its soccer is like heading to Paris and eating only McDonalds: a crime. 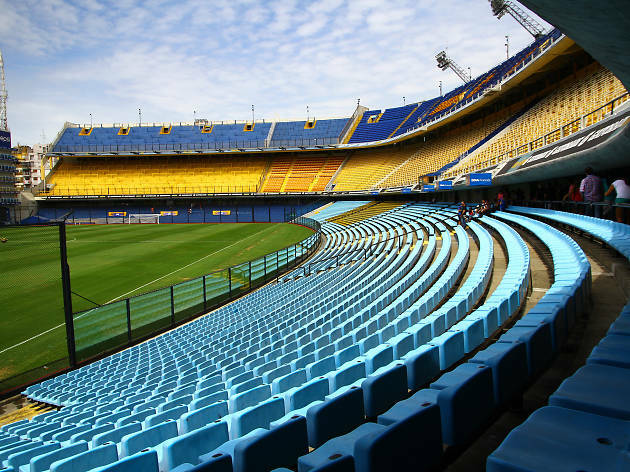 Throw on a bit of blue and yellow (Boca Juniors’ team’s colors), take in a match and, no matter how engaging the game might be, wonder at the excitement and mayhem of the most passionate fans in the world. What is it? A nineteenth-century necropolis sprawled across the BA suburbs that’s home to the statues and mausoleums of Argentina’s most revered tango icons. Why go? 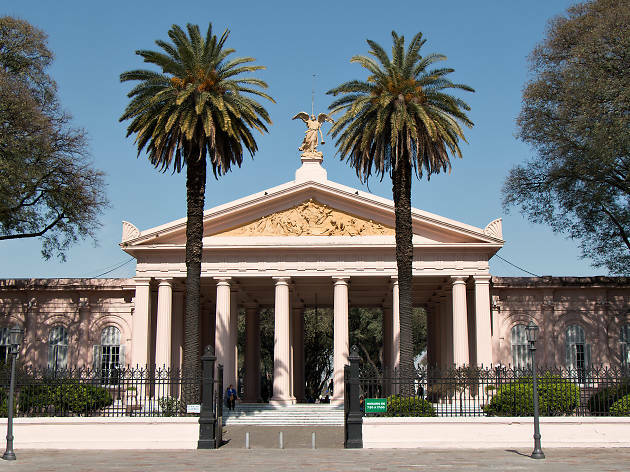 While most tourists head for the Cementerio de la Recoleta to take in the grave of Argentina’s most famous first lady, Eva Perón, the enormous Cementerio de la Chacarita is less crowded and more interesting. Head for the mausoleum of Carlos Gardel, light a cigarette, place it in his hand and pay your respects to one of the founding fathers of tango. What is it? 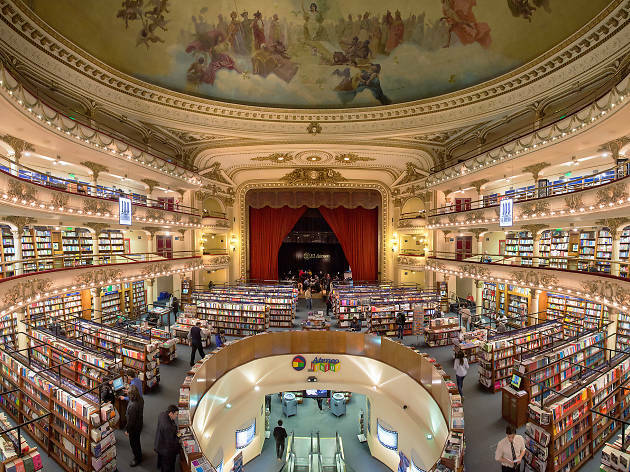 Originally a grand theatre, then a grand cinema, it’s now a grand bookstore. In fact, the 99-year-old Grand Splendid is one of the grandest stores in the world. Why go? Reveling in its own history, the frescoed ceiling, elaborate theatre boxes and even the bold red drapes are all intact, casting an eye-wateringly opulent backdrop for the books. Take the time to sip a coffee and listen to some live piano on the original stage, with sweeping views of the Grand Splendid in all its… splendor. What is it? 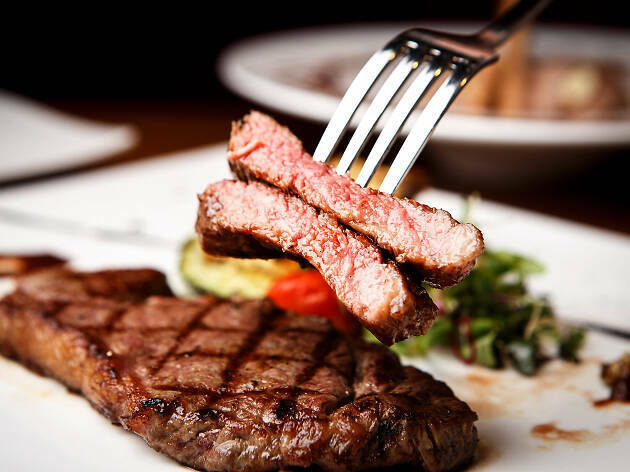 The parrilla, or steakhouse, is the classic Argentine eatery and can be anything from a fine-dining restaurant to a street-side vendor with a makeshift grill. Why go? For the meats – all the meats! That means not just the classic asado barbecue steak and ribs, but also the parrillada mixed grill replete with offal turned into culinary wonders like chorizo, morcilla (black pudding) and chitlins (small intestines). Delicious but quite often gruesome to look at, trust your tastebuds over your eyes and you won’t regret it. For fancy try La Cabrera, for street-side head to Parrilla Mi Sueño. What is it? The life and soul of Buenos Aires. In grand halls and on street corners, everything moves to the beat of the tangoing feet. A milonga is the place to see this in action, and, if you’re brave enough, join in. Why go? To mix with the locals and get a real feel for how tango intoxicates the crowds. 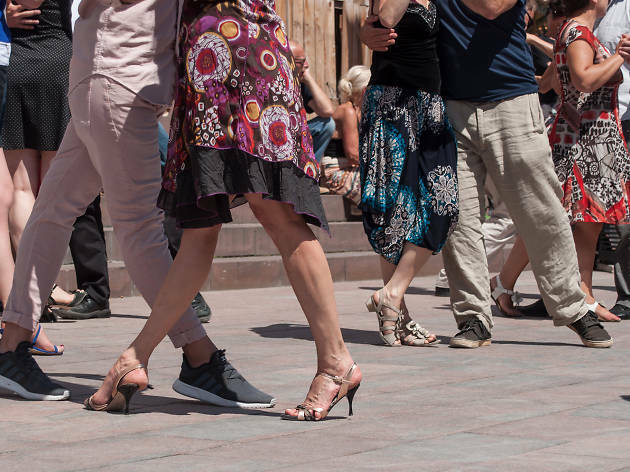 Head to La Milonga del Indio on Sunday evenings to dance al fresco with energetic septuagenarians in the historic Plaza Dorrego, or for a younger crowd, get ready to sweat at La Viruta. What is it? 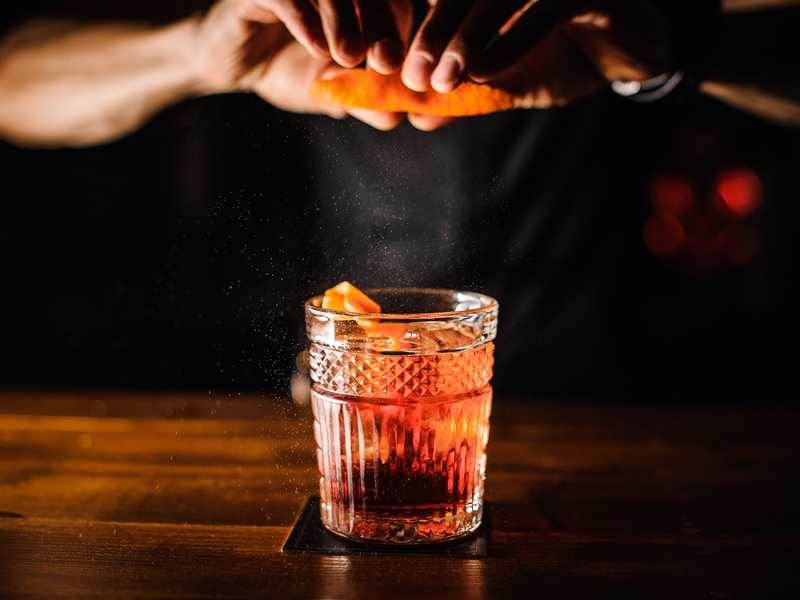 BA’s latest late-night drinking spot is a lush, seventies-inspired cocktail bar and nightclub catering to a stylish and thirsty clientele. Why go? Think Studio 54 for South America and you’re on the right track. Dress to impress (door staff can be picky), sup on glorious martinis and cosmopolitans and drink in the glamour from the oyster-shaped booths. And if the cocktails start to take their toll, order up some caviar and sushi to soak up the spirits. What is it? Preferred haunt of literary giants Borges and Casares, 150-year-old Café La Biela is a BA landmark. 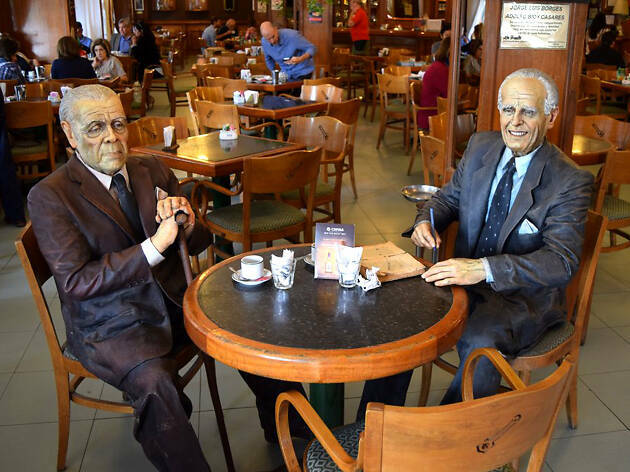 Pull up a seat next to them – their lifesize statues still sit at their favorite table – and indulge in some dulce de leche-infused treats. Why go? A staple for the sweet-toothed and perfect treat post-meaty feast, the milky caramel syrup is infused in everything from cakes to crêpes to coffee across the city. Order a café con leche and a dulce de leche crêpe for the quintessential Argentine sugar hit. What is it? 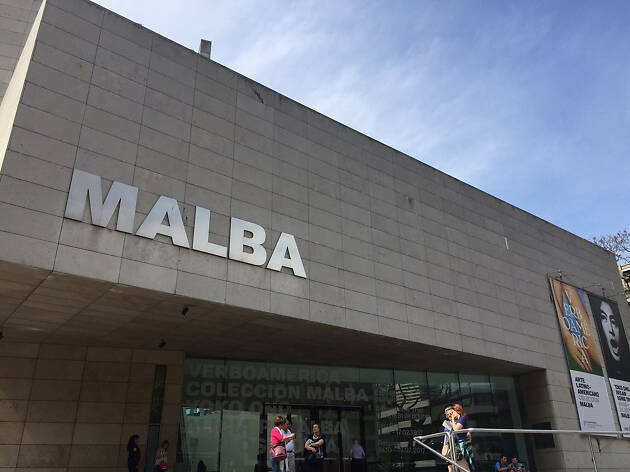 Argentina’s leading contemporary art museum, the Museo de Arte Latinoamericano de Buenos Aires (now you know why they just call it Malba) is a who’s who of leading Latino modern artists. Why go? These works by Frida Kahlo, Diego Rivera and lesser-known locals are fine examples of Latin American art. What is it? 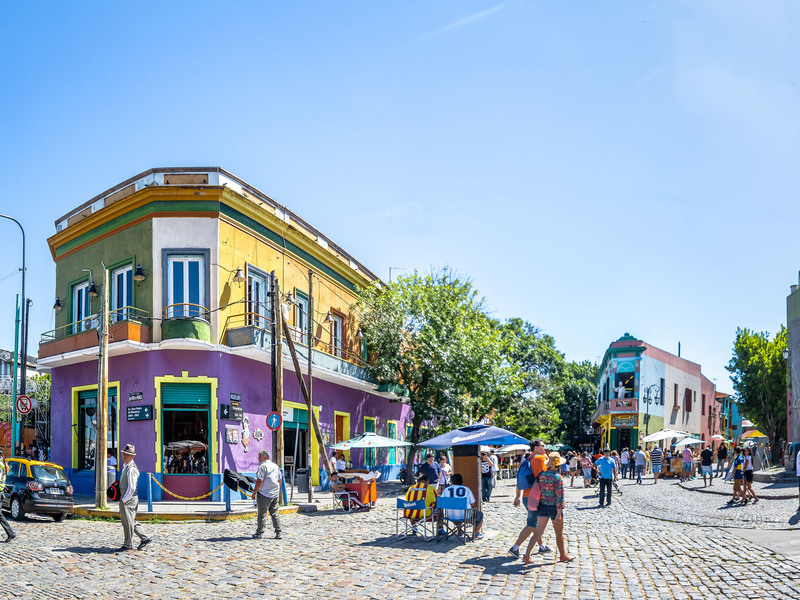 Hidden away amid the brightly painted streets of the La Boca neighborhood, El Caminito is an artist-lined alleyway and street museum with a history as colorful as its buildings. Why go? ‘Little path’ as it translates was the inspiration for the famous tango Caminito and is a cultural cauldron of BA history. 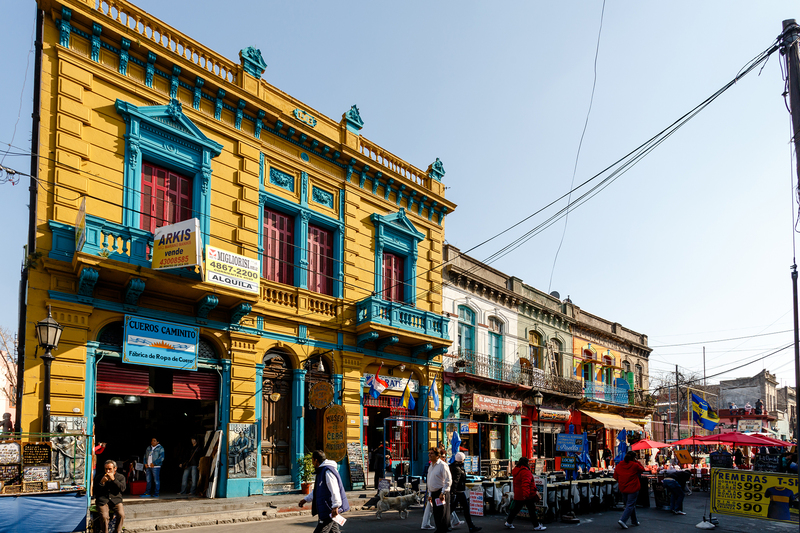 Browse the local artists’ wares, take snapshots of the madly colored conventillos and keep an eye out for the bizarre figures of Che Guevara and Diego Maradona waving from the balconies above. What is it? 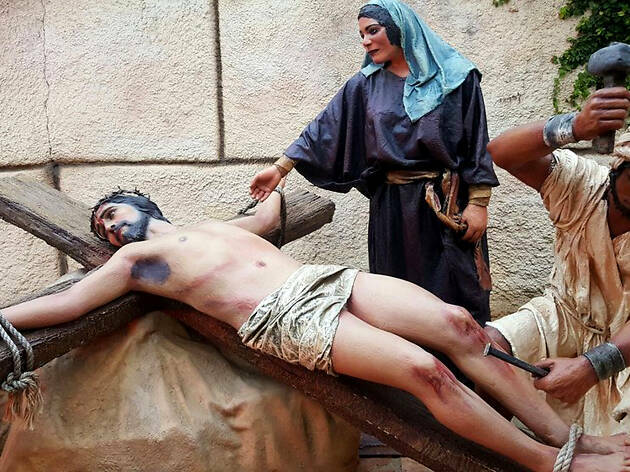 Contender for the world’s most kitsch theme park, the Holy Land of Tierra Santa blends religious icons with liberal doses of animatronics, neon and, well, tack. Why go? Among the many unique spectacles from the Last Supper to Adam and Eve frolicking in Eden, the half-hourly resurrection of Christ steals the show. Seriously. Stand in bemused awe as the 18-meter plastic Jesus rises from a plastic Calvary Mountain before opening his eyes and turning his palms to the heavens. Want to do as the locals do? Explore the local markets in Buenos Aires for a taste of the city's vibrant culture, abundant produce and artisan goods. 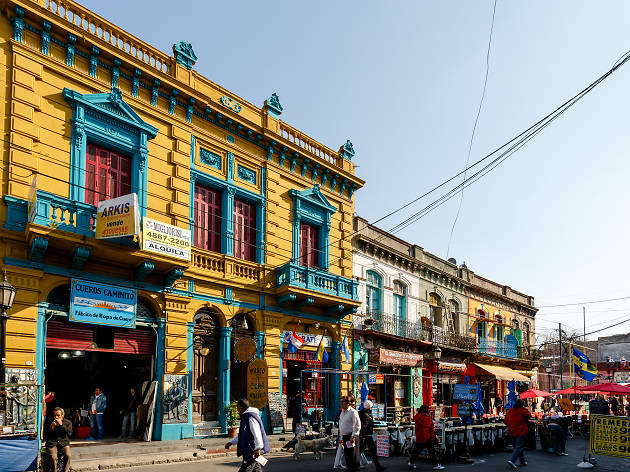 You’ll find a market in almost every neighborhood in the city, but many are worth going out of your way to visit, whether that’s to pick up a vintage bargain, a local masterpiece or just to watch life unfurl in a riot of dance and color on the cobbled streets.